Cancer patients have the highest probability of recovering if tumors are completely removed. However, tiny clusters of cancer cells are often difficult for surgeons to recognize and remove. A camera makes hidden tumors visible during an operation. Tumor removal surgeries pose a great challenge even to skillful and experienced surgeons. For one thing, tumor margins are blending into healthy tissue and are difficult to differentiate. For another, distributed domains of cancer and pre-malignancies are difficult to recognize. Up to now, doctors depend exclusively upon their trained eyes when excising pieces of tumors. In future, a new special camera system can help visualize during operation even the smallest, easy-to-overlook malignant pieces of tumor and thereby support the surgeons during complicated inter- ventions. The trick: the camera can display fluorescent molecules that “paint” the cancer tissue. These are injected into the patients blood circulation prior to the operation and selectively attach onto the tumor during their trip through the body. 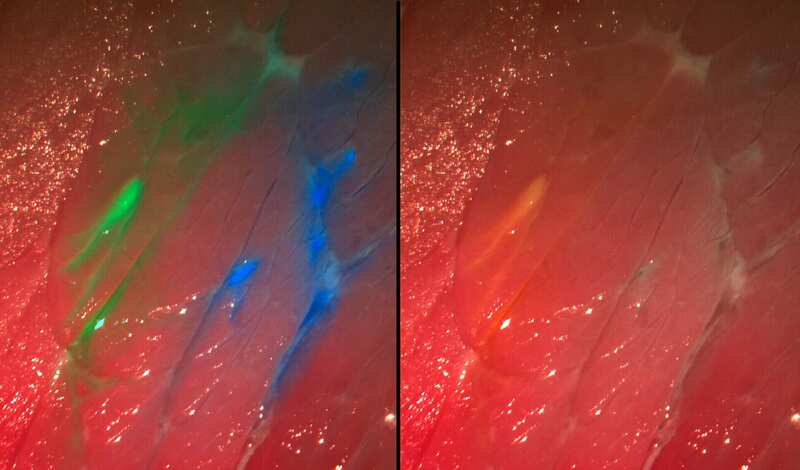 If the corresponding area is then illumimated with a specific wavelength, fluorescence is emitted and the malignant tissue glows green, blue, red, or any other color, depending on the injected dye, while the healthy tissue appears the same. In this way, the surgeon can see clasters of tumors cells that cannot be recognized by the naked eye. Researchers at the Fraunhofer Project Group for Automation in Medicine and Biotechnology (PAMB), which belongs to the Fraunhofer Institute for Manufacturing Engineering and Auto- mation (IPA), have developed a new surgical aid, a multispectral fluorescence camera system. In the future, this special camera will integrate into various medical imaging systems such as, surgical microscopes and endoscopes, etc. The scientists from Mann- heim, Germany, will make the debute of a prototype of this high-tech system at the Medica Trade Fair in Düsseldorf in the joint Fraunhofer booth (Halle 10, Booth F05) between 20-23 November. The novel aspect about this camera: it can display several fluorescent dyes and the reflectance image simultaneously in real time – systems available until now have not been able to achieve this. The advantage: arteries and delicate nerves that must not be injured during an intervention can likewise be colored with dye. They too can then be detected with the new camera, since they are set apart from their surroundings. “The visibility of the dye to the camera depends in large part on the selection of the correct set of fluorescence filters. The filter separates the incident excitation wave- lengths from the fluorescing wavelengths so that the diseased tissue is also set apart from its surround- ings, even at very low light intensities,” says Nikolas Dimitriadis, a scientist at PAMB. The researchers and their colleague require only one camera and one set of filters for their photographs, which can present up to four dyes at the same time. Software developed in-house analyses and processes the images in seconds and presents it continuously on a monitor during surgery. The information from the fluores- cent image is superposed on the normal color image. “The operator receives significantly more accurate information. Millimeter-sized tumor remnants or metastases that a surgeon would otherwise possibly overlook are recognizable in detail on the monitor. Patients operated under fluorescent light have improved chances of survival,” says Dr. Nikolaos Deliolanis, head of the Biomedical Optics Group at PAMB. In order to be able to employ the multispectral fluorescence camera system as adapt- ably as possible, it can be converted to other combinations of dyes. “One preparation that is already available to make tumors visible is 5-amino levulinic acid (5-ALA). Physicians employ this especially for glioblastomas – one of the most frequent malig- nant brain tumors in adults,” explains Dimitriadis. 5-ALA leads to an accumulation of a red dye in the tumor and can likewise be detected with the camera. The multispectral fluorescence imaging system should have passed testing for use with humans as soon as next year. March 21, 2019 - Technology to predict shelf-life of fresh produce FreshPlaza.comFreshPlaza, portal for the *fresh* produce industry, offering the latest news, job advertisements, pricewatching, and photo reports. May 1, 2018 - PHOTONICS PRODUCTS: Scientific CMOS Cameras: sCMOS cameras reach new levels of capability Laser Focus WorldsCMOS cameras are now widely used in a variety of leading-edge microscopy techniques, as well as in astronomy and elsewhere. June 1, 2018 - Tracers for Fluorescence-Guided Surgery: How Elongation of the Polymethine Chain in Cyanine Dyes Alters the Pharmacokinetics of a Dual-Modality c[RGDyK] Tracer Journal of Nuclear Medicine+ Author Affiliations. 1Interventional Molecular Imaging Laboratory, Department of Radiology, Leiden University Medical Center, Leiden, The Netherlands. July 25, 2018 - Catheter Combines Ultrasound and Multispectral Fluorescence to Measure Arterial Plaque Photonics.comA novel cardiac catheter probe combines intravascular ultrasound (IVUS) and fluorescence lifetime imaging (FLIM) in a single device that can image the. July 25, 2018 - Multispectral Camera Detects Tumors During Surgery Photonics.comA multispectral camera that simultaneously displays several fluorescent dyes and the reflectance image in real time could help surgeons ensure that th. May 23, 2018 - Butterfly eye inspires cancer-detecting camera Insight NewsResearchers have used the eye of a morpho butterfly as inspiration to develop a multispectral camera that can more easily detect cancer-stricken tissues. January 4, 2019 - Seeing through time: Conservator Mark Mackenzie | Pasatiempo Santa Fe New MexicanThe Stewart L. Udall Center for Museum Resources is only 14 years old, but it can be mazelike. In the midst of one of its warrens is the former storage. March 19, 2019 - Saving the lost text of a Torah scroll University of RochesterProfessor Gregory Heyworth and his students reveal illegible text that could create a sacred, tangible link with Jewish congregations lost to the Holocaust. October 18, 2017 - Quantalux sCMOS camera Imaging and Machine Vision EuropeThorlabs has announced the release of its new 2.1 Megapixel Quantalux sCMOS camera based on a high‐performance 1e‐ read‐noise imager. July 25, 2018 - Multispectral Imaging Extends Vision Technology Capability Photonics.comMultispectral imaging takes the detection capability of machine vision beyond just color inspection. With wafer-level coating of multispectral filters. September 4, 2018 - Image Cytometry Technology and Tissue Analysis News-Medical.netImage cytometry or tissue cytometry, not only measures the size, diameter and shape of a cell, but quantifies the molecular marker expression. November 27, 2018 - Inside the search for the Bible and other original sacred texts National GeographicIn the shadowy world where religion meets archaeology, scientists, collectors, and schemers are racing to find the most precious relics. June 1, 2018 - Machine vision LED Lighting vendors diversify their product offerings Vision Systems DesignWith the advent of UV and IR-based LEDs, machine vision lighting manufacturers can offer a broader range of products that span a wider illumination spectrum. December 13, 2016 - SurgVision Displays Tumors During Surgery MedgadgetAt RSNA 2016 in Chicago, SurgVision, a Dutch firm, was showing off its intra-surgical molecular probe fluorescence imaging system designed for excising. July 25, 2018 - Laser Combiner Enables Scanning Fluorescence Endoscopy Photonics.comA laser-scanning fiber endoscope uses a plug-and-play laser combiner to enable high-contrast images suitable for detecting early-stage precancerous l.
July 25, 2018 - Microlens Array Spawns Massive Microscope Image Photonics.comA new multispectral device is said to have produced the largest microscope image ever, combining 13 color channels gathered by thousands of microlense. July 25, 2018 - Optical Sensors Advancing Precision in Agricultural Production Photonics.comAgricultural production, already incredibly efficient in much of the developed world, is increasing each year — this is a necessity to feed the. July 2, 2018 - Using a laser diode or quantum-cascade laser? Don't forget the electronics Laser Focus WorldDrive electronics play a significant role in laser diode (LD) and quantum-cascade laser (QCL) system performance. Both laser types have specific. October 3, 2017 - New cardiac catheter combines light and ultrasound to measure plaques Medical XpressTo win the battle against heart disease, cardiologists need better ways to identify the composition of plaque most likely to rupture and cause a heart attack. September 18, 2017 - Dangling above the action, Spidercam covers corn, not Cornhuskers Lincoln Journal StarITHACA — Suspended over a farmland acre, just a pigskin's throw from Nebraska 66, a camera is focused on the action below. July 25, 2018 - Hyperspectral Imaging Enables Industrial Applications Photonics.comHyperspectral imaging systems supply classification and identification information, in addition to image information. This property makes them useful. August 8, 2018 - Unexpected contribution of lymphatic vessels to promotion of distant metastatic tumor spread Science AdvancesTumor lymphangiogenesis is accompanied by a higher incidence of sentinel lymph node metastasis and shorter overall survival in several types of cancer. June 14, 2018 - Northrop Grumman's Playground for Engineers San Diego MagazineGet to know the technology and innovators making waves in the Rancho Bernardo company's FabLab incubator. April 3, 2018 - Raman spectrometers: Emphasis on biosciences Laser Focus WorldRaman spectrometers sensitively detect organic materials for bioscience, medicine, food and agriculture, and forensics. July 26, 2018 - Ultrafast Lasers Enable High-Density Data Storage Photonics.comA laser-based data storage and retrieval technique could increase the storage capacity of conventional optical discs, such as DVD and Blu-ray, without. December 5, 2013 - Machine vision: A look into the future Vision Systems DesignImagine a world where the laborious and repetitive tasks once performed by man are replaced with autonomous machines. May 5, 2015 - Choosing LED lighting and controllers for machine vision systems Vision Systems DesignThe proper choice of illumination wavelength, lighting topology and control are important when specifying LED lighting.